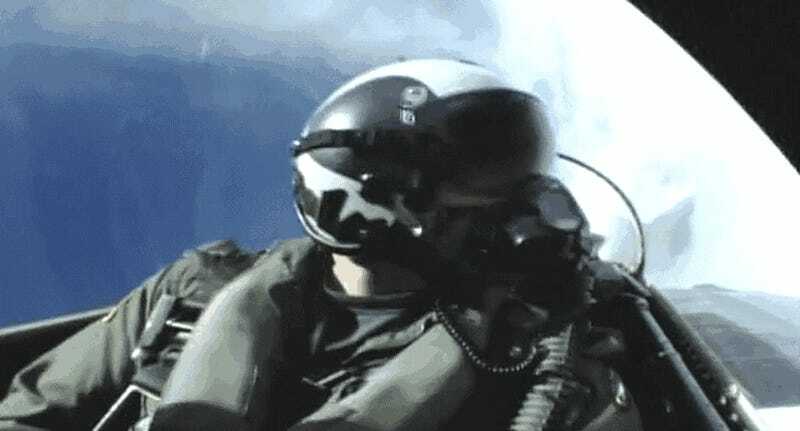 We were upside down in an F-14D Tomcat, climbing through 10,000 feet on the second half of our dirty double Immelman when the Ft. Lauderdale airshow boss called out traffic on our east side. I looked over and saw a Southwest Airlines 737 jet passing the opposite direction and probably a mile away. I checked our navigation page to confirm we were still in the airshow box. Being the Radar Intercept Officer (or RIO), I told my pilot, Rocco, that I had sight of the jet. It was a non-factor, and we were well within the performance box boundary. Regardless, it is a surreal feeling to be hanging upside down in the ejection seat straps and see that familiar orange and blue plane level with you going the opposite way. We finished up the show by diving back down into the sneak pass, but I always wondered if any of those passengers saw us and if so, did they want to trade places? If you’re reading this article now, maybe you would want to trade places too. It’s hard to believe that it has already been 10 years since Rocco and I flew the final Tomcat Demo at Naval Air Station Oceana Virginia. The big fighter had a huge following at airshows and was always one of, if not the most popular single plane demos on the circuit. Because of its sheer size and speed, it easily became a crowd favorite. The variable geometry wings, when swept back, made it look even faster. Heck, the plane even had a movie made about it, but the airshow was where you got to see it in real life. Much like the Blue Angels, the Tomcat was a key recruiting tool for the US Navy. Therefore, a “quality spread” of airshows determined where the Tomcat would be seen in order to maximize the recruiting footprint. When the schedule was being planned, Demo Team aircrew were able to pick a “home” show location during the year. Otherwise, each show location was heavily scrutinized. In the final full year of the demo, there were approximately 22 show locations ranging from large shows like Ft. Lauderdale and Chicago, to smaller shows such as the ones in Ft. Worth and Rhode Island. Airshows are where some of the most dangerous flying in the world can be found. Not only are you performing high-speed maneuvers very low to the ground, but thousands of anxious fans line the runways to get a glimpse of the action up close. However, this risk was mitigated by the best training system in the world. Any pilot and RIO combination, who had a reasonable amount of time in the jet and a little practice, could have performed the Tomcat demonstration. That’s a great testament to our system. There were no special maneuvers or aerobatic tricks. It was just a show that put the jet through the proper paces. The Tomcat came back for one final airshow at NAS Oceana in 2005, which was also the debut of the Navy’s newest fighter, the F/A-18 E/F Rhino. That show was the only opportunity to see both fighters perform side by side, and those two performances showed the beginning of a new era and the end of a great one. The best way to equate the two jet demos is to use a speed versus agility comparison. The Tomcat looked sleek, fast, and powerful, but it could also look a bit lumbering in some of the maneuvers with its wide motors and huge size. One of the most impressive Tomcat maneuvers was the high speed pass followed by the vertical roll. Seeing such a big jet perform a dirty double Immelman was an eye opener. Conversely, the Super Hornet, with its huge LEX’s (Leading Edge Extensions), performs extreme high alpha maneuvers and has the ability to quickly pirouette in the other direction. Some of the massive unloads (pitch-down maneuvers) have to be brutal on the aircrew from a negative-G standpoint. If you ever see the Rhino demo in person, you’ll walk away impressed with the dirty roll on takeoff and the square loop. It was a great year and fun to reflect on certain things you remember from your time on the circuit. It’s really hard to single one out, but one that stands out in my mind was the Columbia, Missouri Airshow for Memorial Day weekend. It was probably the smallest airshow we attended, but we had the opportunity to meet and talk with a number of amazing military pilots including a few of the Tuskegee Airmen and Fred Cherry, who was a POW during the Vietnam war. It had a very humbling effect on me. I loved the Chicago airshow. Before entry into the airshow box, you hold over Soldier Field. The show appropriately takes place near the Navy pier and you can see a well defined “box” created by all of the boats on Lake Michigan. Flying upside down while looking at the Sears Tower is something you don’t get to do everyday. The turnout is huge and the people of Chicago are very welcoming and appreciative of the military in general. One of my favorite stories was from the Chicago Airshow. I was flying the demo with one of our reservists, a prior demo Rear Intercept Officer (RIO), John “Roll” Keiser. We had to launch from Gary, Indiana and hang out over Soldier Field next to the Sears Tower in downtown Chicago. After being called in to start the demo, we completed the first pass in front of the crowd and pulled vertical to re-position for the next maneuver. In this process we roll inverted and unloaded the aircraft to maintain level flight, which requires a full -1 g for approximately three to four seconds. Immediately after the unload, I noticed behind me something unusual in my mirrors. Once we rolled upright, Roll advised me he needed me to fly straight and level for a minute. Evidently the lap belts that fasten us to our ejection seat had not been done up properly (or quite possibly forgotten but we’ll never admit that) and during the inverted maneuver he ended up in the canopy in a jumbled mess. Needless to say we got it sorted out and finished up the performance with no further incidents. I was at the big Nellis Air Show, and everybody was buzzing about the first public demo of the F-22. Lots of generals in the bleachers, the whole deal. The F-22 was just plain lame. Hard deck of 1000 feet AGL [height above ground level], weak turns, no high-speed passes. Like they’re afraid to break the thing, which they were. Who’s up next on the schedule? Why, the Tomcat, of course. These guys just beat the place up. Flogged this Air Force base mercilessly. The crowd goes bananas, and I’m yelling along with them. Tell me who those two lunatics were, and I’ll buy them a cocktail. My biggest impression of the demo season was the interest people had in discussing the Tomcat and Naval Aviation in general. I enjoyed using my love for aviation and the Navy to inspire young people to pursue their dreams. On the other hand, I was simply amazed at how many people loved the Tomcat. It has to be one of the most popular planes in the history of aviation. There’s the P-51 Mustang, the SR-71 Blackbird and the U-2, but none of those really matched the swagger that the Tomcat brought to the table. It was great to roll into town and realize that you had a jet that was going to be the star of the show. I still have people to this day talk about how much they loved the jet. I just wish the younger generation had a chance to see it live. But there were a few maneuvers that we did that stood out, for both good and bad, during the demos themselves. Rocco’s favorite was the simple high-speed pass, as it had such a huge impact on the crowd. Not only did it consist of high speeds, but it was one of the few maneuvers in which were allowed to fly closer to the ground. Plus, seeing such a huge fighter like the Tomcat moving that fast, that loud, and that low had to impress anybody. Including us pilots. The dreaded Cuban 8 was awful, though. A bit like a vertical figure-eight in mid-air, Rocco thinks this is a fun maneuver. But I see no reason anyone needs to be inverted, hanging upside down from the ejection seat straps, pointed at a 60 degree downward angle, at only 2500 feet above the dirt. Enough said. But let’s take you through a full show. During airshow season, we always had two birds for the flying portion and a third bird for any static displays. Our maintenance folks did whatever it took to get the jet ready for a great show. They might have been the biggest fans in attendance and they did not want to disappoint anyone. All maneuvers had a 200 feet above ground level bottom. The airshow box is normally defined as a five mile radius from show center, from zero to 15,000 feet. The Federal Aviation Administration has specific guidelines on performing maneuvers—with most maneuvers being performed parallel to the crowd line. Each team had to be present at the morning FAA brief to insure compliance and clarify any questions. As with all things Tomcat, the pilot and RIO worked in tandem. The pilot flew the maneuver and the RIO was the ultimate safety observer. Either person could call an abort on a maneuver. Both worked as a team to maximize the jet’s capabilities. This was a normal takeoff until right after getting airborne. You wanted to level off immediately after the wheels were off the ground and bring the gear up. Too soon on the gear retraction and both tires could be blown, as once the gear cycle starts both brakes were applied to prevent the tires from spinning up into the aircraft. This attitude was held until approximately 350 knots for the max-G pull into the vertical. The low rotation to the end of the runway is fun, but always a bit of a high stress situation. It doesn’t feel normal to be hugging the ground right after liftoff. The good news is you get away from the ground pretty darn fast. I loved looking backwards after we had cleared to get a good view of the show area. We would enter the Flat 8 with approximately 325 knots/200 feet about 45 degrees off the show line. This, as true with all maneuvers, required vigilance in entry speed and altitude to provide a stable starting point. We selected afterburner anytime the exhaust was facing the crowd. The hardest part was to modulate this to maximize the effect and not overspeed/overstress the aircraft because the engines put out so much power. Each turn was a max-G 270 turn with wing reversal in between. This is the first “maneuver” of the show, so inbound headings are key. Additionally, the reversals needed to be at show center, so the jet needed to be positioned just right to make sure we were not off from the main body of the crowd. A call of CANS ON! CANS ON! was also made by the RIO. “CANS” is a slang term for the engines. CANS ON! means the engines are pointed at the crowd and afterburner should be selected. You really need to be able to turn completely around—much like checking for a bandit at your six o’clock. We used this, and the slow roll, in demonstrating the full potential of the wingsweep capability of the F-14. We could manually sweep the wings or use an auto feature that swept the wings as a function of airspeed. We would have to roll past 90 degrees to get the lift vector on the crowd so they could see the entire aircraft. It was vitally important to keep an eye on airspeed while manipulating the wings to prevent getting too slow to effect a recovery. This was more difficult than usual because the wings were swept aft and there is a loss of lift due to aerodynamics. This maneuver is a bit awkward feeling. Normally with the wings swept aft you are much faster. The RIO made sure the wings began their proper schedule back and gave a verbal call of “Wings are moving, moving, moving, back”. The slow roll required more than the usual amount of coordination between the pilot and RIO. This was due to the important coordination of airspeed, proper wingsweep movement and the required height in the inverted position. If any one of these tasks wasn’t accomplished properly, the maneuver would be aborted and a recovery necessary to avoid hitting the ground. The RIO set the cadence and had specific callouts to ensure proper completion. The call was “Wings, 2, 3, 4, 5, 6, 7, 8, CANS, 9, 10.” The RIO’s job was to look outside to make sure the wings were scheduling properly forward. The full roll should be completed smoothly and at a constant pace, thus the reason for the timing call. This was a fun maneuver that required pointing at the ground approximately 60 degrees nose down and fully inverted. The entire canopy was completely filled with Mother Earth while we descended, and then at about 3,000 feet we rolled upright and completed the second half. Upon completion we executed a carrier break, a high angle of bank/high G 180-degree turn to set up for the simulated carrier pass. Alignment with the crowd line and a countdown of altitude is key here, with a call to roll upright once 3500 feet is hit. If you didn’t have your harness locked on this maneuver, your head would hit the canopy. (I always had my harness locked. Well, maybe not every time). We fully configured the aircraft to show what the F-14 looks like when coming in for a carrier arrestment aboard the boat. The pass was fairly benign compared to the rest of the show but the follow on maneuver was challenging. At show center we selected full afterburner and turned away from the crowd at a 45-degree angle, pulling nose up to hold about 180 knots, all while retracting the gear, tailhook and flaps. This usually required around 60 to 70 degrees nose up. Then, once we attained enough altitude, we executed a full split-S maneuver to return for the minimum radius turn. The challenge lay in being at a very low altitude and pointed directly at the ground. Maneuvering out required a very smooth and patient pull to avoid stalling the stabilators that controlled the pitch of the whole plane. A big part of it was making sure to stay on the 500-foot line so you aren’t too close to the crowd. Run through the landing checklist to ensure the landing gear and arresting hook are down. Final checklist is repeated by the pilot and confirmed by the RIO. On the outbound, need to check the CANS are on and hook and gear are coming up. On the climb-out is one of the best times to turn around and look at the crowd moving away from you—fast. Entry for this tight turn was about the same as the Flat-8, around 325 knots. The toughest part of this turn was maintaining proper altitude. If we got too low, a slight decrease in the angle of bank was required to adjust, and the converse applied if we got too high. There was a lot of feel required to execute this properly and make it look smooth from the ground. Again, check your position on the showline as this maneuver can be tight to the crowd line. Six and a half G’s being pulled will put you back in your seat. You also need to maintain a good tight turn to be ready for the double Immelman, followed by a CANS ON call for the crowd. You feel like a cat screeching across a linoleum floor with this maneuver. The important aspect of the Double Immelmann – both the clean and the dirty – was angle of attack and energy management. In other words, you had to avoid getting too slow or that would lead to an unpredictable flight regime. As long as the pull up both times was smooth and close to the proper entry speed it was very predictable. Once competed we usually topped out around 13,000 feet around 300-350 knots. At this point we had a few moments to gain speed and position for the high-speed pass. During this period, Smokin’ Joe would usually have the airshow commentator feed our radio transmission over the loudspeaker to say “hi” to the crowd. When talking to the crowd, I always took off my oxygen mask so I could speak more clearly. If you sound too much like Darth Vader, the crowd can’t understand what you are saying. This was the fun part for the RIO because you could always call out to friends and family, plus make up something that would have sounded extremely corny on land but sounded really cool coming from a Tomcat up in the air. This pass allowed us to fly closer to the crowd with high speed and engines at military power or in afterburner. We would typically target between .90 - .96 mach to avoid an unwanted supersonic pass. As amazing as that would be, it can be quite damaging and depending on the weather conditions on the day, it was a real challenge to get close to that without punching through “the number.” However, days that had high humidity would produce the most amazing vapors forming off the aircraft with this maneuver. Once past the crowd we pulled up to 90 degrees in the vertical. Immediately after talking with the crowd, it was back to business as the high-speed pass is where you can really get yourself into trouble. I would begin calling out mach numbers with more inflection in my voice as we got closer to the number. A number of 1.0 meant we were hitting the speed of sound. For the record I remember calling out .98 on the final high speed pass at that last show at Naval Air Station Oceana. After passing the show center, the RIO calls out “wings to bomb,” and then picks a target on the ground to sight for the vertical roll. As the pull upward begins, “roll, stop roll” done twice is the call for the vertical roll. When the target on the ground is visually acquired, “stop” is called, making the roll more precise and near 360 degrees. This maneuver finishes around 13,000 feet so you have to watch your altitude so that you don’t go outside the airshow box. The break, as described earlier, was modified slightly from a 90-degree roll away from the crowd to now a 270-degree roll towards the crowd where we would end up pulling away. With the wings back and around 440 knots the aircraft was amazingly agile in the turn. It took many shows to fine tune the roll to make it look sharp. The touch and go was a standard landing with the hook up. This was to show the vertical descent required all the way to touch down for a carrier arrestment. However, the main purpose was to prepare for the most impressive maneuver, the gear-down Double Immelmann. For the slow pass-to-touch and go, you looked to touch down near show center. This was most of the time in the middle of the runway. Touching down in the middle of the runway doesn’t feel normal because you are giving up half of your landing space. There’s an old saying among pilots that any runway behind you is useless. This was certainly the most challenging portion of the show. After the touch-and-go our entry airspeed of 180 knots was required before the pull while staging full afterburner. Due to the extension of the landing gear we were limited in the amount of G’s the aircraft could pull before doing significant damage. It was vital that a constant 14-unit angle of attack be maintained while pulling up and through the vertical. Additionally at the top of the first Immelmann, we had to ensure we weren’t pulling any G’s in the reversal for fear of damaging the gear. This maneuver is all about the GE 110 engines. If you weren’t careful, the jet could overspeed the flap limits. Again, vertical alignment was key along with making sure the angle of attack did not go any higher than 14 units. This is probably the most impressive maneuver in the entire show—not many jets could do this with the ease of the Tomcat. With the altitude we had now gained we maneuvered behind the crowd to execute a ‘sneak’ pass for the final break for landing. Being such an iconic and large fighter, all eyes were on us, and followed us for the last 450-550 knot pass to reposition for the final landing. I’m not convinced it was always a sneak pass, but fun nonetheless. This was our final chance to “haul the chili.” Speed is life and the Tomcat had it. The entire demo probably only lasted about 12 to 13 minutes, but it was a workout. After the final rollout, you were excited, relieved and tired all at the same time. Sadly you can’t see the Tomcat demo anymore, and it’s very likely there will never be an attempt to fly a commercialized variant of the Tomcat as long as Iran is still flying them. There was a rumored attempt by Dale “Snort” Snodgrass to get a few mothballed Tomcats out of the boneyard to start a Tomcat legacy demo team sometime around 2008 or 2009. It didn’t get much traction, probably for a number of reasons including cost, concerns with parts being illegally exported to Iran, and meager legislative support. Instead, the Department of Defense began to destroy many of the existing Tomcat inventory rather than have them continue to be mothballed. But we do want to make a plug for the Super Hornet Demo. It’s a pretty impressive show and those who enjoy airshows should make an effort to see them when they make a stop near your hometown. The only real problem is it’s just not the Tomcat.